>Blog>What Is The Endocannabinoid System? Some consider the discovery of the endocannabinoid system to be a miracle. Cannabis can "unlock" this system and, in fact, is partly responsible for its discovery. The endocannabinoid system (ECS) has received much attention in recent years. The story begins in Israel, 1964. Dr. Raphael Mechoulam identified the main psychoactive component in cannabis, coined as tetrahydrocannabinol (THC). He also discovered a way to isolate it from the cannabis plants via extraction. Afterward, cannabidiol (CBD) was discovered and isolated as well. In 1988, Allyn Howlett and William Devane found the first cannabinoid receptor in a rat's brain. Afterward, scientists discovered that cannabinoid receptors are abundant in the human brain. The isolated THC was used to further map the location of cannabinoid receptors. In 1990, Lisa Matsuda and her colleagues pinpointed the DNA sequence in rats that creates the cannabinoid receptor sensitive to THC. Following this discovery, scientists were able to remove this specific cannabinoid receptor from mouse test subjects. These mutant mice didn’t get "high" from THC like regular mice. This is when scientists were able to pinpoint the effects of THC on a specific cannabinoid receptor, which is now known as CB1. It was discovered in 1992 that there is an entire network of endocannabinoids and cannabinoid receptors, which together form the endocannabinoid system. Mechoulam discovered that we produce a natural endocannabinoid, anandamide. "Ananda" is a word taken from Sanskrit, which translates as "bliss". 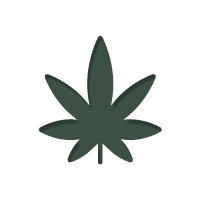 Phytocannabinoids, "phyto" meaning plant, derive from plants such as cannabis. In 1993, the second cannabinoid receptor CB2 was discovered. In 1995, 2-arachidonoylglycerol (2-AG) was discovered by Mechoulam and his team. The endocannabinoid system has also been found in plants, other animals, and insects. The endocannabinoid system was named after cannabis, which played an integral role in discovering this complex system. The ECS comprises three main components: endocannabinoids, cannabinoid receptors, and metabolic enzymes. The endocannabinoids are produced naturally in our bodies; "endo" means "inside/within" in Greek. Cannabinoid receptors like CB1 and CB2 reside on the surface of cells. They are activated when they interact with endocannabinoids. Metabolic enzymes break down endocannabinoids after they’ve been used by the cannabinoid receptors. The interaction between these components helps our bodies maintain homeostasis, an internal marker of physiological equilibrium. The ECS plays a crucial role in regulating mood, sleep, appetite, motor control, the immune system, memory, pain, temperature, and several other functions. CB1 and CB2 receptors are the most studied cannabinoid receptors to date. We also have other cannabinoid receptors, such as GPR55 and GPR119, however, more research is required to pinpoint their exact function. The CB1 receptor is abundant in the central nervous system; it helps to regulate brain functioning. The CB2 receptor is also located in the central nervous system, although to a lesser degree. Most CB2 receptors are located in the immune system. The function of CB1 and CB2 receptors are unlocked when endocannabinoids and/or phytocannabinoids interact with them. There are two main endocannabinoids, anandamide and 2-AG. They are created in cell membranes and are synthesised when necessary. In the brain, endocannabinoids function as retrograde signals, which flow backward from the "receiver" neuron to the "sender" neuron, telling it to cool down when overactivity is detected. Endocannabinoids are also generated in other organs, which unlock unique functions. For example, immune cells eliminate germs by sending molecular messages commanding neighboring immune cells to attack. Endocannabinoids are a part of this molecular messaging system. Phytocannabinoids deriving from cannabis are simply called cannabinoids, which may create some confusion. Either way, there are over 100 cannabinoids present in cannabis. The most prominent ones are THC and CBD, which are also the most studied cannabinoids to date. Research is also being conducted on other cannabinoids such as THCV, CBDA, CBN, CBG, and other less prominent cannabinoids. FAAH and MAGL are metabolic enzymes present in our body. FAAH breaks down anandamide, and MAGL breaks down 2-AG. This helps regulate the ECS. When endocannabinoids bind to cannabinoid receptors with a specific mission, once the mission has been completed, the metabolic enzymes remove the endocannabinoids from the binding sites, restoring balance. THC is the cannabinoid that gets us high and induces psychoactive experiences. Different cannabinoids have different binding strength with cannabinoid receptors. THC mainly activates the CB1 receptor. Since metabolic enzymes don’t break down THC like they do anandamide, THC stays for longer, causing a "high". THC has been shown to function well for pain relief, stimulating appetite, reducing nausea, and alleviating MS symptoms. First, CBD is non-psychoactive, meaning it doesn't get you high. CBD works mostly with CB2 receptors. CBD is currently put on a pedestal in terms of cannabinoid research due to its potential to relieve numerous medical conditions. CBD inhibits the FAAH enzyme, which breaks down anandamide. Inhibiting FAAH is shown to work for well for reducing anxiety. CBD also works as an endocannabinoid modulator, mediating the amounts of endocannabinoids flowing into the brain. CBD has displayed promising results for the treatment of epilepsy, anxiety, autoimmune diseases, cancer, and many other conditions. CBD also affects how THC binds to cannabinoid receptors. When too much THC has been consumed, it can cause anxiety, which can potentially be prevented by consuming CBD. This unique interaction between cannabinoids and other plant constituents is called the “entourage effect”. We discovered the endocannabinoid system only 25 years ago. We still have a lot to learn about the ECS and how cannabis can help with its functioning. So far, the research is looking promising; who knows, maybe one day cannabis will be scientifically proven to cure cancer! Either way, let’s support further research to explore the possibilities of cannabis and its effects on the ECS.